Looking for some entertaining ideas for your Fall parties and gatherings? 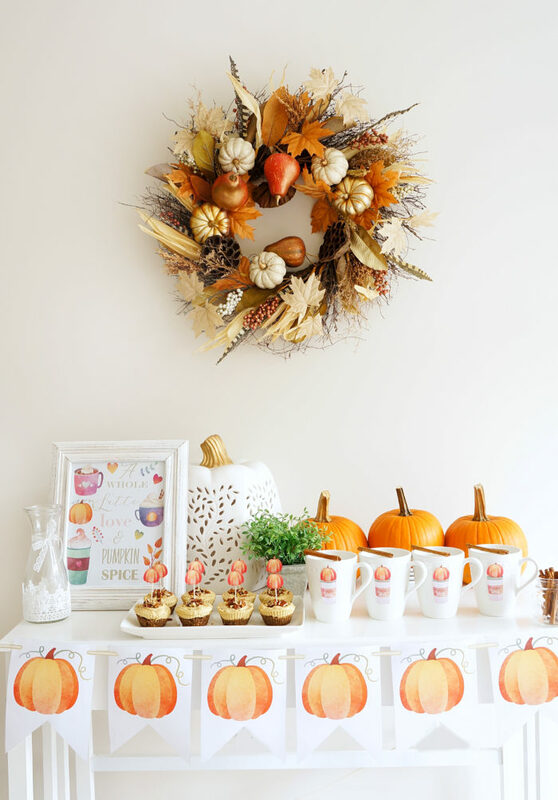 This post is full of tips for decor and food and also includes free Fall printables for a cute Pumpkin Spice Party! As much as I enjoy certain elements of all of the seasons, I’ve always especially had a thing for Fall. When the temperatures drop and I start to see pumpkins and autumn flowers pop up at the store, it’s always a sign that Fall is just around the corner. A part of me loves the coziness of the season — the sweaters, scarves, apple crisp, butternut squash soup and pumpkin spice lattes just give you this warm and cozy feeling, don’t they? I also tend to associate fall with entertaining since it’s that special time of year where family and friends gather to celebrate Thanksgiving or host fun little Halloween or Fall-themed parties. With all of the fresh pumpkins, and fall-themed wreaths and flowers, it’s such a fun and relatively easy time of year to decorate. AND the best part is, you don’t have to spend an arm and a leg on fall decorations. 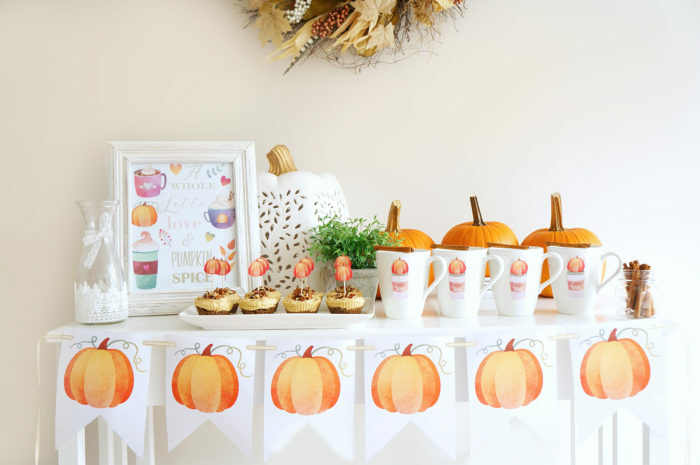 Especially when you incorporate fresh pumpkins from the market and some cute (and FREE) pumpkin party printables! A few weeks ago, I came across THE CUTEST fall-themed clipart and couldn’t resist the urge to create some cute party printables, so I’ve included these for you to download for all of your fall party planning needs! 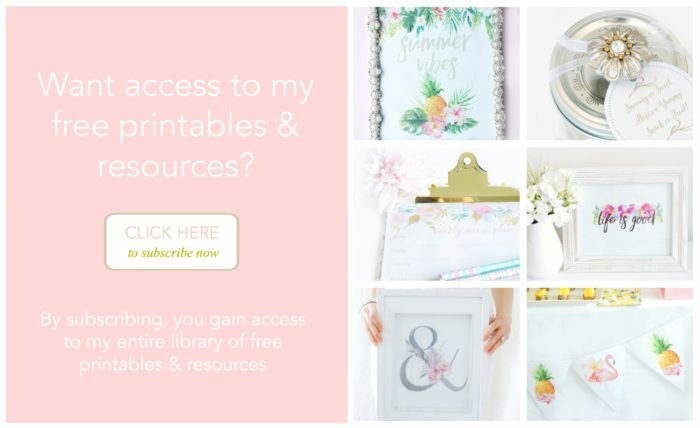 You can find some tips on how to incorporate these printables below! 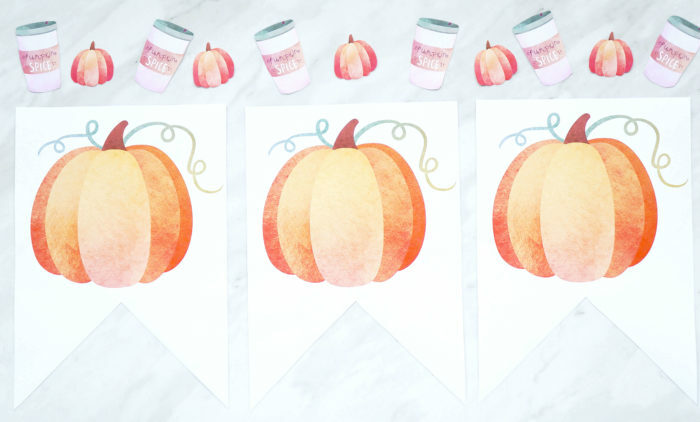 The first printable is this DIY Fall Banner, which you can download HERE. 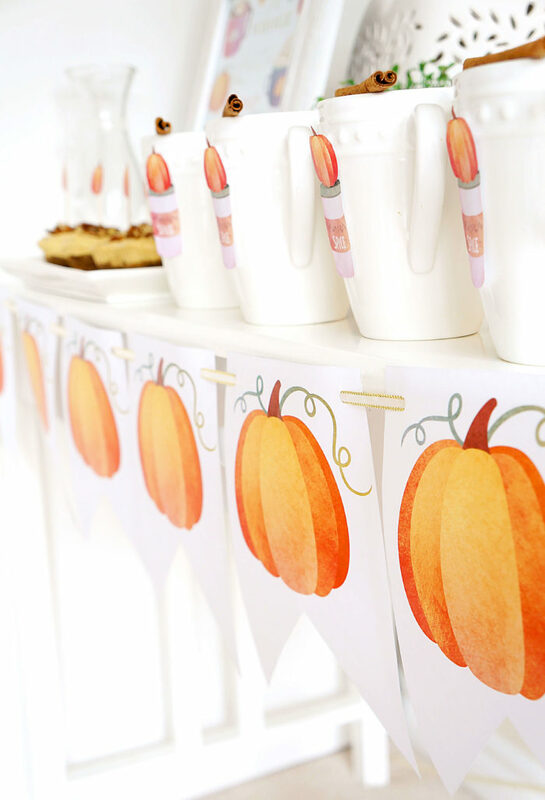 Simply print out the desired number of banner pieces that you need to fit across your table. I like to print it out on white card stock paper to make it more durable. I chose to print out six pumpkins, but you could print out more or less depending on the size of your table. I’ve also included an option for you to print out the word “Fall” along with the pumpkins if you want to switch it up. It’s totally up to you and the look you’re going for! Cut out each banner piece along the inside of black line (so that you don’t see the black edges). Next using a hole puncher, punch holes in the upper hand corners of each of the banner pieces. (TIP: stack all of the banner pieces on top of each other and cut the holes at the same time so they all line up). Cut your ribbon to the appropriate length and string through holes until all of the banner pieces are strung to the ribbon. I like to insert the ribbon from front to back so that you don’t see the ribbon across the front of each banner piece, but it’s a personal preference. Hang banner on front edge of table using tape to adhere each end to the table. You could also hang it up on the wall or across a fireplace mantel as well! 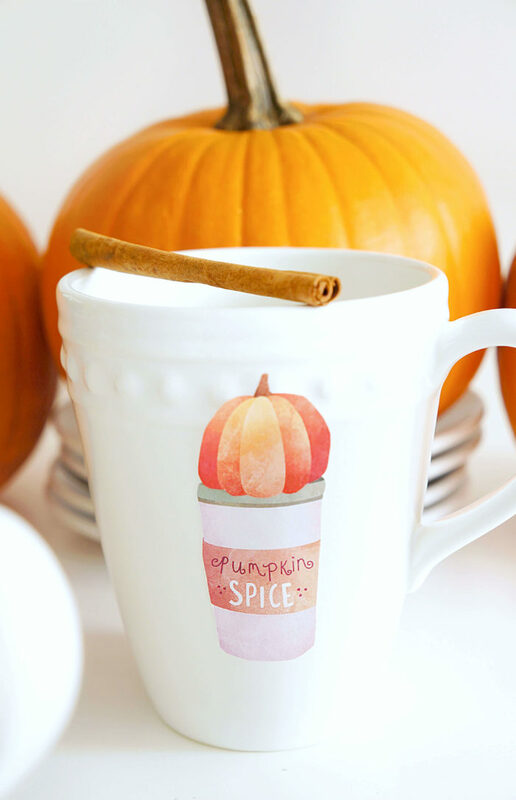 The next free printable I created is this Pumpkin Spice Printable. 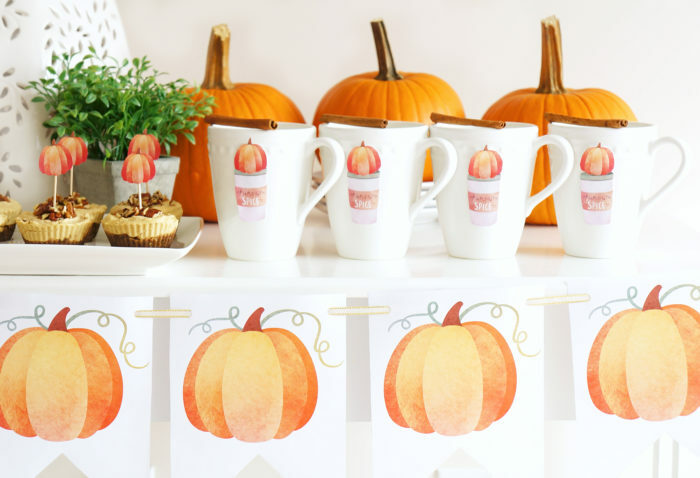 How cute is this printable for a Fall-themed party?! 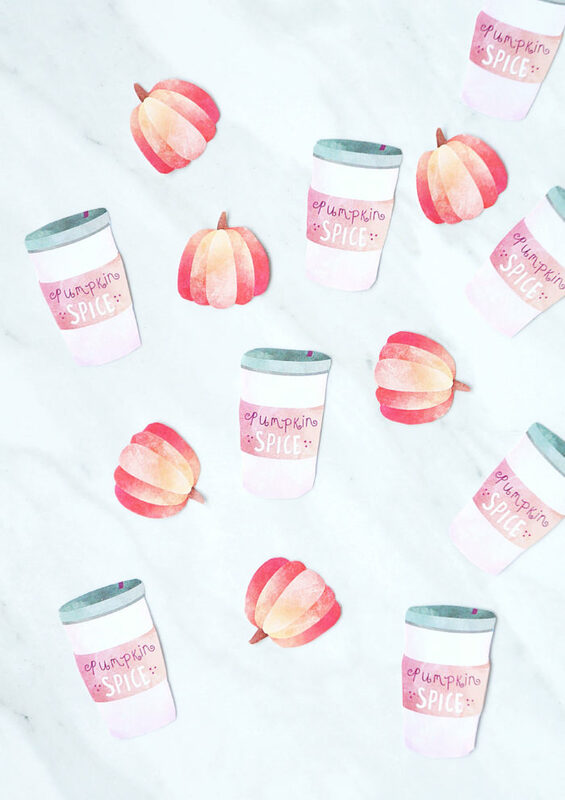 And who doesn’t love lattes and pumpkin spice? It makes me happy just looking at it! 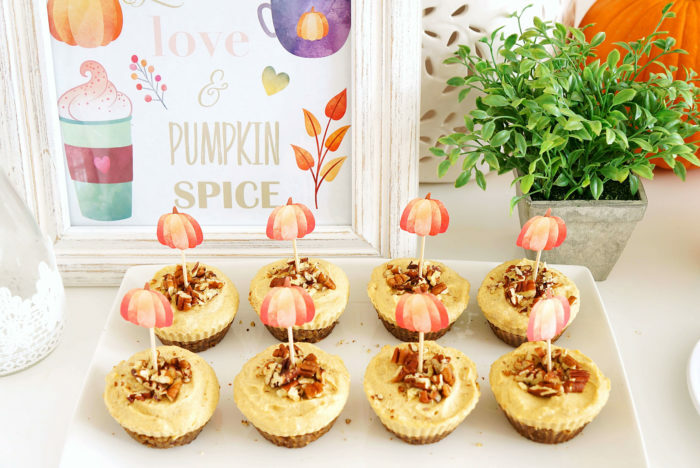 It’s especially great if you’re a pumpkin spice fan and plan on incorporating pumpkin spice-themed food and beverages like these No-Bake Pumpkin Spice Cheesecake Cups or these Maple Pumpkin Spice Lattes at your party or gathering. Simply print out the printable and trim the edges to fit your frame. I used an 8×10-inch frame. To ensure that the printable fits perfectly in the frame, simply remove the glass insert and set it in the middle of the printable. Trace around the edges with a pencil. It acts like a ruler and helps you cut a straight line! You can do it freehand, but if you’re anything like me, the cut won’t be very straight. Once you’ve drawn your lines around the edges, cut along the line. Secure the printable into the frame. 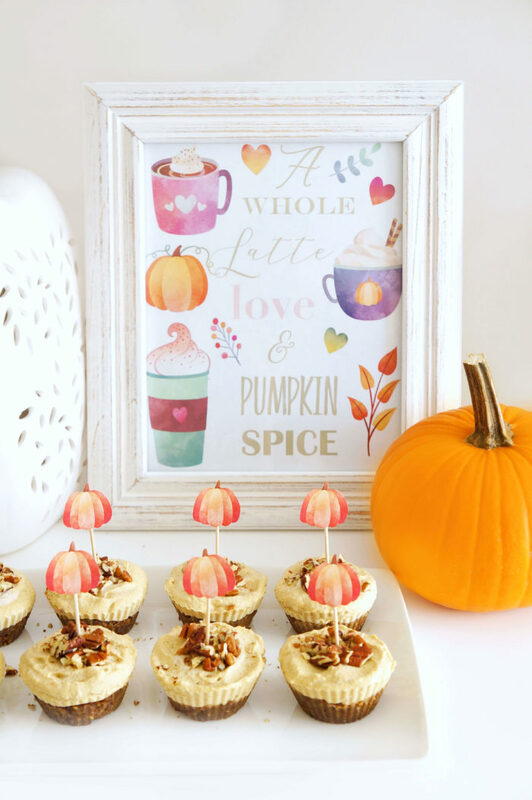 Set up the framed printable on your party table to add a pop of colour and spice ;) Alternatively, you could hang it on the wall if you choose to do a different set-up or simply use it as everyday fall-themed home decor. So many options! 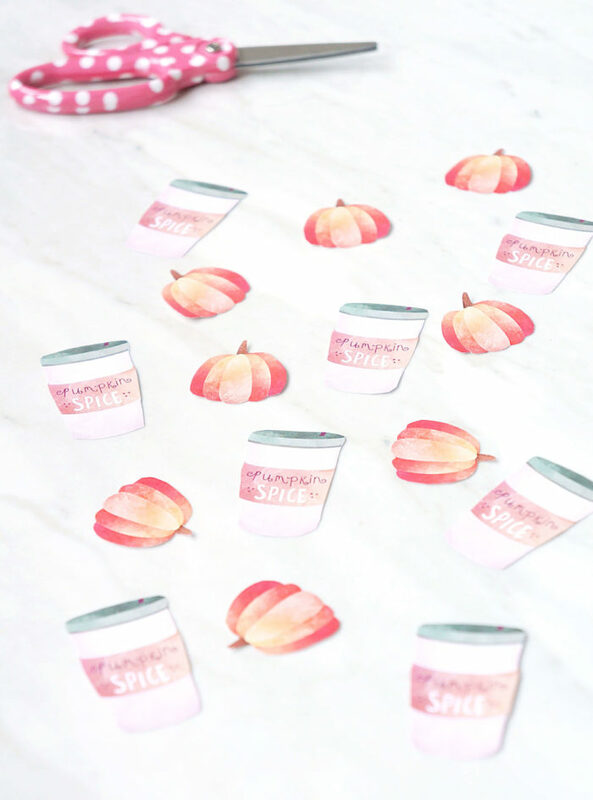 Last but not least, I created these mini pumpkin spice and pumpkin printables (download them HERE) and the options are really endless with these cute accents. 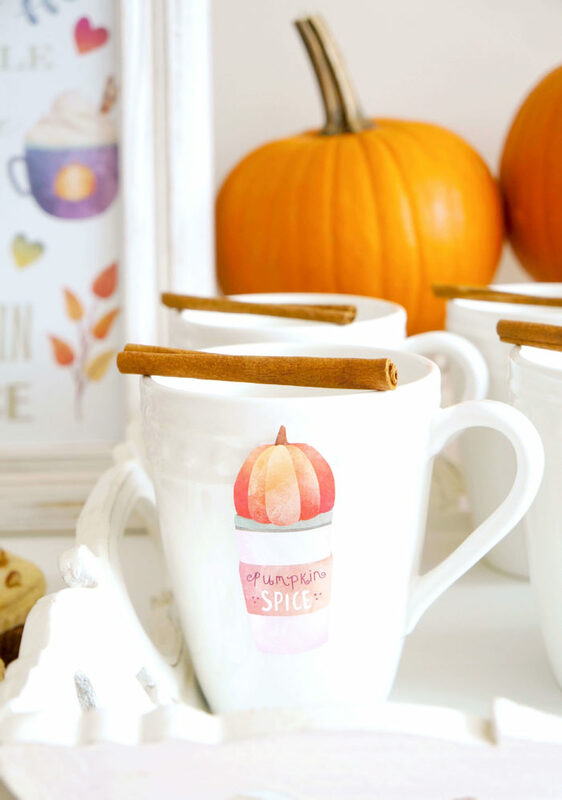 Cut the mini printables out around the edge of each image and stick them to white mugs or cute cups using double-sided tape to tie in the Pumpkin Spice theme. Stick them to straws and serve them along with a pumpkin-flavoured smoothie or whatever autumn-themed beverage you might be serving. Glue them to blank cards to make your own DIY party invitations. OR you could use them as toothpick toppers and tape them to individual toothpicks. Simply poke them into pumpkin-themed food items that you might be serving for a cute autumn-themed look. 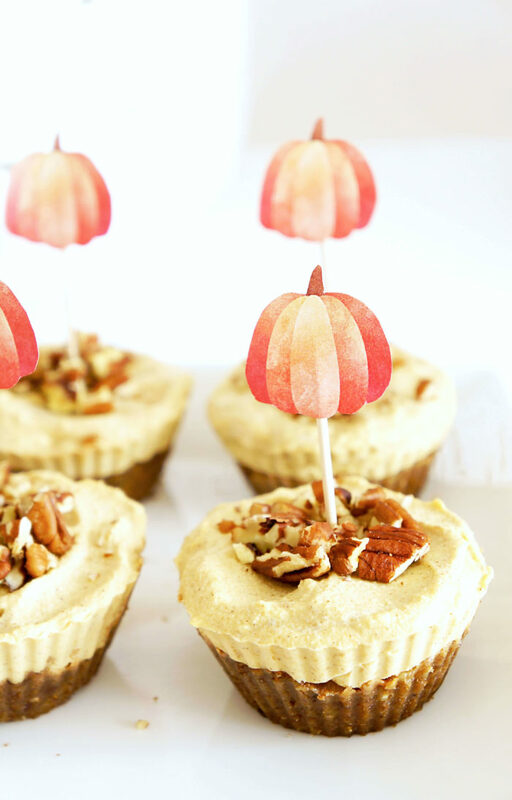 For my pumpkin spice party, I poked them into these No-Bake Pumpkin Spice Cheesecake Cups. You could even use them as a cute confetti sprinkled across the table! 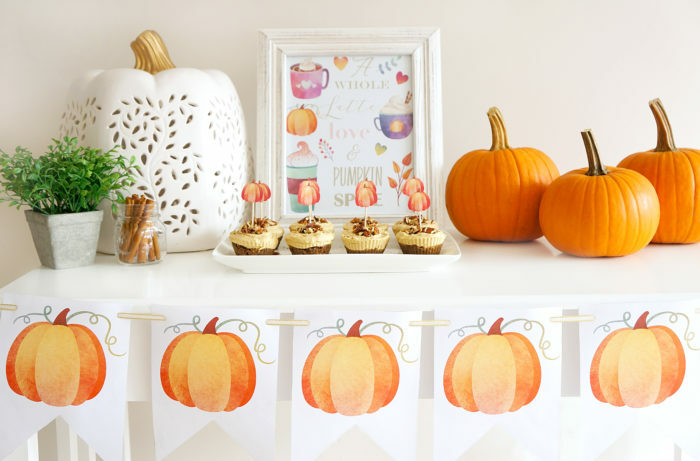 There are so many ways you could use these printables to spruce up your Fall party table! Now that we’ve established the decor and food, let’s put it all together. 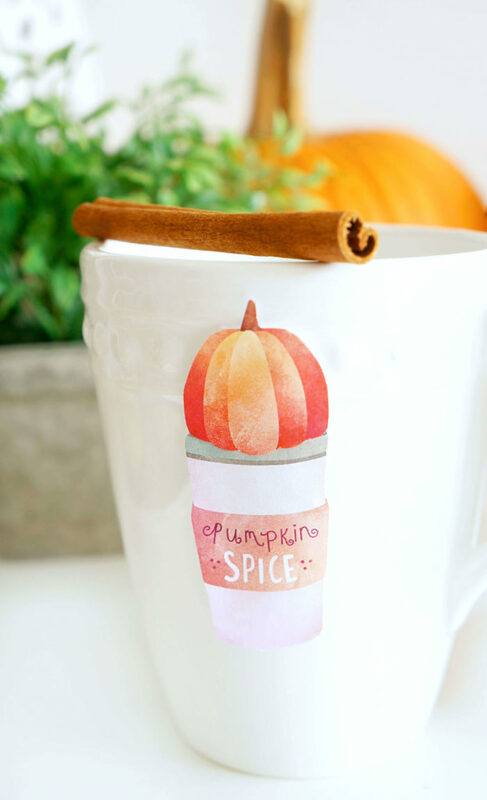 How do you plan on using these cute Fall printables? Let me know in the comments below! These are so cute! I also can’t resist fall decor. I was born in November, so fall has always been my favorite season!